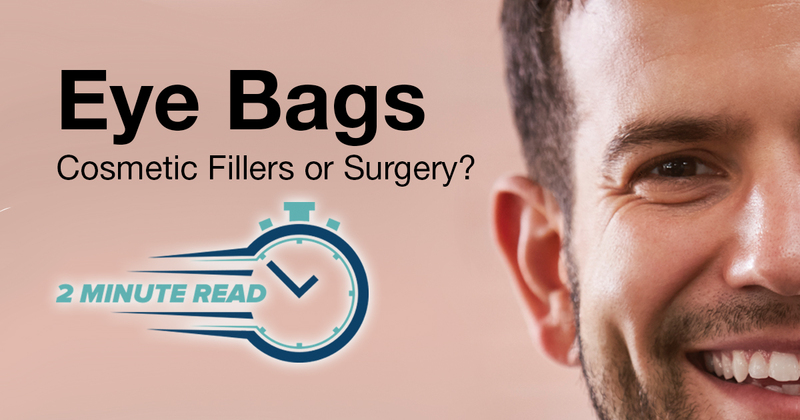 Eye Bag Treatments: Cosmetic Fillers or Surgery? Dr. Bracci, I have read all the opinions online and am still unclear, what is the best treatment for my under eye bags, surgery or cosmetic fillers? Let’s begin here. The most common cause of undereye bags is the loss of support underneath the skin in the area below the eyes, resulting in a hollowing effect and under eye creases. Now that we understand the cause, the question is ‘What is the best way to restore lost support?’ While I cannot tell you which option is right for you, I can provide the facts of each procedure so you can decide for yourself. The surgical procedure for under eye bags and creases is called blepharoplasty. During the procedure, skin is cut and tissue or even fat or muscle is removed. The goal of the surgical procedure is to the stretch and pull the skin to cover the loss of support in the under-eye area. Surgery does not restore lost support. Instead, it merely disguises it by cutting away the sagging skin and stretching the remaining skin to a new position. When skin is cut and moved the changes are permanent, even though as we age further support continues to be lost. People may benefit from surgery; if you decide surgery is right for you, choose a surgeon who specializes in surgery exclusively around the eyes. Treating the entire under eye areas with fillers is a popular option because the results are not permanent since the skin is not cut and no tissue is removed. During a filler procedure, fillers are applied below the skin with the goal of returning the skin to its original position. By restoring support to the area with cosmetic fillers, patients appear more rested, younger and natural. The benefit of cosmetic fillers is they are not permanent, and results CAN be adjusted as our we continue to age and support loss continues. To address undereye bags and restore the natural architecture of the area, I have created the non-surgical procedure, EyeRise. Most of the clients I see with under eye bags are looking to significantly reduce or eliminate the condition, making them ideal candidates for EyeRise. The key to EyeRise is that I have specialized only in cosmetic injectables for nearly 20 years, I do not practice any other subspecialties. During treatment, drawing on my expertise, I use a cannula to inject a tailored combination of injectables into each layer underneath the skin to restore the skin to its original position. The decision of surgery or non-surgical injectables to treat under eye bags is a lifestyle decision. When selecting a treatment plan base your decision on your personal needs and which option will provide the best long-term results and ability to adjust as you age.